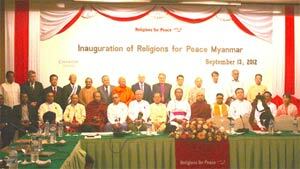 Each month TIO shares a few of the more interesting interfaith stories from recent news. National Council of Elders in session. We are the National Council of Elders. We are veterans of the Civil Rights, Women’s, Peace, Environmental, LGBTQ, Immigrant Justice, Labor Rights and other movements of the last 60 years. We have come together in Greensboro, the birthplace of the Sit-in Movement in 1960, to birth a movementthat can share the torch of freedom, justice, peace, and non-violent action with those who have risen anew in the 21st century. 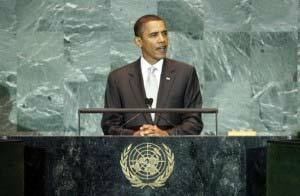 WASHINGTON — President Obama on Tuesday (Sept. 25) gave a forceful speech at the United Nations, in which he challenged much of the world’s assumptions about free speech and religion. Monica Willard speaking at the U.N.
Monica Willard of the United Religions Initiative U.N. Cooperation Circle reports that faith based organizations (FBOs in UN Speak) are being brought in to advise on a post-2015 reworking of the MDGs. We are looking now for a possible funding level of post-2015 MDGs at 10% of the level of military expenditures. Given the sky-high levels of military funding, 10% would be a huge amount of money towards the goals. Native peoples are concerned about the effects of abandoned uranium mines on or near their lands. These types of problems in terms of disrespect toward Native American land are the main issues about which Native American leaders have approached the White House of late. The Obama administration on Monday began reaching out to Native American political and spiritual leaders to address concerns over the protection of sacred sites on federal land. Tribal leaders said they’re frustrated. Some feel consultation between the federal government and tribes has become just a formality despite promises by the administration to improve discussions. To the surprise of few who follow religion closely but to the chagrin of many even casual observers, researchers at the Pew Forum on Religion and Public Life documented a disturbing rise in restrictions on religion in the United States between mid-2009 and mid-2010. The U.S. was one of only 16 countries to record a rise in both government restrictions and social hostility toward religion. This was the first time in the course of Pew’s research the U.S. saw a rise in both measures. Women representing more than 25 faiths congregated Saturday morning at The Church of Jesus Christ of Latter-Day Saints campus for the inaugural Irvine Women’s Interfaith Conference. The conference – which intended to create a sense of unity among local women of different backgrounds and religions – was open to women ages 18 and older in Irvine and bordering areas. This sleepy town not far from the Czech border, in a hilly corner of Catholic Bavaria, is an unlikely place to find an active synagogue, and an even unlikelier focal point for a controversy that some see as a threat to religious tolerance in Europe and even the place of Jews in Germany. Rabbi David Goldberg, a jovial 64-year-old Israeli who serves a community of about 400 Jews in Hof, has become an international cause célèbre after four German citizens filed criminal complaints against him with the local prosecutor. His alleged crime, which made headlines in Israel and elsewhere, was performing ritual circumcisions. Seventy European Muslim and Jewish leaders pledged on Wednesday to show “zero tolerance” to hate preachers of any faith including their own ranks, citing what they called rising religious intolerance on the continent. Imams, rabbis and community leaders from 18 countries agreed to jointly counter bigotry against Jews and Muslims and combat legal threats to common religious practices such as circumcision of boys and the kosher and halal ritual slaughter of animals. The two-day meeting brought together Muslim-Jewish teams from around Europe to compare experiences in fighting religious prejudice and report on recent trends against minority faiths. Pope Benedict XVI urged Middle Eastern Christians and Muslims on Saturday to forge a harmonious, pluralistic society in which the dignity of each person is respected and the right to worship in peace is guaranteed. Can Religion Save Africa’s Elephants and Rhinos? Standing before a pile of charred elephant ivory as dusk covered the surrounding savannah, Christian, Muslim and Hindu religious leaders grasped hands and prayed. Let religion, they asked, help “God’s creatures” to survive. Poachers are escalating their assault on Africa’s elephants and rhinos, and conservationists warn that the animals cannot survive Asia’s high-dollar demand for ivory tusks and rhino horn powder. Some wildlife agents, customs officials and government leaders are being paid off by what is viewed as a well-organized mafia moving animal parts from Africa to Asia, charge the conservationists. 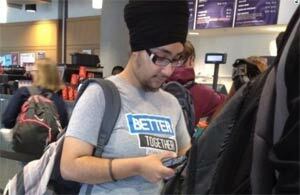 A picture of a woman with facial hair wearing a turban posted to the social media site Reddit has garnered a firestorm of Internet reaction and has taught at least two Ohio college students lessons in graciousness, humanities and religious studies. A 20-year old college student, who asked to remain anonymous, says one of his friends took the photo at a library at The Ohio State University. He’s “not really sure why,” but after he and his friends shared the picture amongst themselves, he posted it to Reddit.